Need a fast prime lens? How about three of them? And don't want to swap lenses? Well now that far-fetched idea is a reality thanks to the new Sigma 24-35mm ƒ/2.0 Art lens. This full-frame DSLR lens is the world's first zoom lens for full-frame cameras with a constant ƒ/2.0 aperture. Providing three versatile prime lens focal lengths -- 24mm, 28mm and 35mm, plus all focal lengths in-between of course -- the new Sigma 24-35mm ƒ/2 aims to offer the convenience of a zoom lens with the optical quality and fast aperture shooting qualities of a prime lens. Mirroring the same construction and aesthetic design characteristics as Sigma's other recent Global Vision Art-series lenses, Sigma 24-35mm ƒ/2.0's build quality and styling is top notch. The lens will be offered for Canon, Nikon and Sigma lens mounts, though it's compatible with Sigma's mount-swapping service should the need arise. It also works with Sigma's USB Dock configuration tool. At the time of this review, the date of availability and price had not yet been released, however Sigma has since announced the lens will become available in late July for a street price of US$999. Check out B&H or Adorama (Canon, Nikon) for more info on pre-ordering and to sign up for availability notifications. Buying this lens, or any other item, at one of these trusted affiliates helps to support the site and keep the reviews coming! Sigma is on a roll when it comes to sharp lenses. Like other recent Global Vision lenses we've tested, the Sigma 24-35mm certainly does not disappoint in this area! On full-frame cameras, even wide-open, the Sigma 24-35mm produces sharp, very sharp, images. At 24mm ƒ/2.0, we must concede that while the center region is nearly tack-sharp, there is some softness in the corners, which isn't all that surprising to be honest. Stopping down a bit sharpens thing up considerably in the corners, and by ƒ/4.0, things are practically razor sharp across the whole frame. At the other focal lengths, we measured similarly sharp centers and slightly softer corners at ƒ/2.0, though the center region at 24mm measured sharper over a wider area of the frame compared to the other focal lengths. Overall, though, wide-open performance is great at all focal lengths, which is what we were hoping for. Stopped down, the Sigma 24-35mm also displays impressive performance when it comes to sharpness. We found ƒ/4.0-5.6 to be the "sweet spot" for critical sharpness at all focal lengths we tested, with the most corner to corner sharpness. We did measure a slight increase in softness as you stop down past this point, but the impact on image sharpness is very minor. Even diffraction-related softness is extremely minor by the time the lens is stopped down to its smallest aperture of ƒ/16. When mounted to a sub-frame camera, we also found excellent sharp results, even wide-open. As expected, the wide-open corner softness experienced when using a full-frame camera is significantly reduced when using a sub-frame -- there's still some corner softness at ƒ/2.0, but it's very minor. Sharpness overall, however, throughout the focal length range is very impressive, with nearly tack-sharp images at practically all apertures, especially between ƒ/4.0-ƒ/8.0. Diffraction barely takes a toll on image sharpness at the very small apertures, either. Chromatic aberration, on both full- and sub-frame cameras, is very low -- and very consistent -- at all apertures and throughout the zoom range. Measured CA averages below three hundredths of a percent of frame height at all times; that is to say, very low. In tests shots, upon close inspection, we can see some very minor green and purple fringing along high contrast edges out in the corners of the frame -- at both f/2.0 and at ƒ/8.0. Overall, though, it's very minor and could be cleaned up easily with a little post-processing. Being a wide-angle, wide-aperture lens, it's not surprising to find some vignetting characteristics, especially in full-frame images. Indeed, on a full-frame camera, the Sigma 24-35mm displays noticeable vignetting, particularly at ƒ/2.0. The level of vignetting is remarkably consistent at all focal lengths, though. At ƒ/2.0, vignetting nearly climbs off our charts, however, with light falloff measuring around 1.25EVs on the full-frame camera. Stopping down to ƒ/2.8 reduces vignetting significantly to around 0.75EVs, but once the lens hits ƒ/5.6, vignetting hovers just above 0.25EVs of shading for the rest of the aperture range. On a sub-frame camera, vignetting is much less of an issue. At ƒ/2.0, vignetting measures between 0.25EVs and 0.5EVs (though it never reaches as high as 0.5EVs). Stopping the lens down to ƒ/2.8 drops vignetting well below 0.25EVs, and it remains at that low level from here on out at all focal lengths and apertures. Like vignetting, we weren't surprised to see some barrel distortion on this wide-angle lens, however, it's rather well-controlled at all focal lengths. At 24mm, on average, barrel distortion hits just under +5% on a full-frame camera (maximum distortion still measured well under +1%). At the longer focal lengths, average distortion hits just above the zero mark. For sub-frame cameras, the distortion graph closely mirrors what we found with full-frame cameras, though to a lesser magnitude. At 30-35mm, average distortion is practically nonexistent. Like many recent Sigma lenses, the 24-35mm ƒ/2.0 uses their Hyper Sonic Motor drive, with an updated AF algorithm according to Sigma for smooth, quick and quiet autofocus operation. The Sigma 24-35mm does indeed focus very quickly, taking only about one second to rack focus from the minimum distance out to infinity. The AF motor is also nearly silent, with our lens technician even stating, "you feel it more than hear it." Of course, manual focusing is also available, with the lens having a large rubbery focus ring, focus distance scale, and a dedicated AF/MF switch on the side of the barrel. 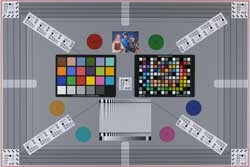 The HSM autofocus system also provides full-time manual focus override of autofocus. The focus ring provides about 90-degrees of rotation and has soft stops at close-focus and infinity distances (the ring will continue to rotate indefinitely past these soft-stops). Like the Sigma 18-35mm ƒ/1.8 DC HSM "A", the new 24-35mm has a nearly identical close-focusing distance of just 11 inches (0.28cm) with a 1:4.4 (0.23x) magnification ratio. The lens isn't designed for true macro photography by any means, however, it's not bad for close-up shooting. 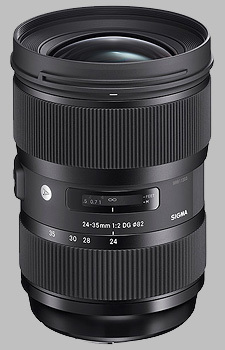 The Sigma 24-35mm ƒ/2.0 Art lens follows other recent Sigma lenses in terms of build quality, construction and design. Part of their Global Vision design strategy, the Sigma 24-35 features their characteristic sleek, matte black finish and thickly gripped zoom and focus rings. The barrel itself is constructed out of Sigma's proprietary Thermally Stable Composite material, which, due to its similar thermal properties to aluminum, allows for much tighter manufacturing precision compared to standard polycarbonate plastics. The lens, therefore, feels great in the hand. The build quality is excellent and feels very solid. Now, with this solid build comes a slight downside: weight. As we've experienced with some of Sigma's other recent zoom lenses, this Sigma 24-35mm is a hefty lens. Tipping the scales at just over two pounds -- similar to Canon's original 24-70mm ƒ/2.8L lens -- the Sigma 24-35mm has a lot of glass inside that barrel, which was needed in order to make a constant ƒ/2.0 full-frame zoom lens possible. The lens does feel a little heavy and bulky mounted to a camera body. However, the lens itself is not too long, and overall, it balances nicely in the hand. The simplicity of having a prime-like fast aperture zoom lens combined with the reduction in overall weight from not having to carry around multiple prime lenses, we feel, more than makes up for the heftiness of this single optic. As for the optical construction itself, the Sigma 24-35mm is comprised 18 total lens elements situated in 13 groups with a 9-bladed, circular aperture diaphragm. The lens makes use of a single Fluorite-like premium FLD glass element, seven SLD elements as well as one or two large aspherical elements (Sigma's website lists one aspherical lens, while their original press release info states two). On the exterior, the styling and features are more or less standard fare for a Sigma Global Vision zoom lens. Both the zoom and focus ring have thick, coarsely-ridged rubbery coatings for a comfortable and secure grip. The focus ring out toward the end of the lens has a lighter amount of rotational resistance; just enough to prevent accidental changes to manual focus, but light and smooth enough to move with one or two fingers. The zoom ring on the other hand is much stiffer and heavier feeling, even though it only has a small amount of rotational travel (with only four marked focal lengths). Nevertheless, the ring rotates very smoothly and only takes a thumb and forefinger to rotate easily. The lens ships with a petal-shaped bayonet-mount lens hood and soft case and is compatible with 82mm filters (the front element does not rotate nor extend during focusing or zooming). The Sigma 24-35mm ƒ/2.0 Art is pretty much in a league of its own at this point in time, as neither Canon nor Nikon offer a similar "prime-like" zoom with an aperture faster than ƒ/2.8. Canon offers the 16-35mm ƒ/2.8L II and the 24-70mm ƒ/2.8L II zoom lenses, with the former going much wider and the latter providing double the telephoto reach of the rather limited 24-35mm focal length range of the Sigma. However, the smaller ƒ/2.8 apertures are at a full stop disadvantage when it comes to low-light shooting, and the Canon lenses each cost quite a bit more. Nikon, similarly, offers a pair of wide-angle zooms: the 17-35mm ƒ/2.8D and 24-70mm ƒ/2.8G. Again, like the Canon alternatives, you're left with ƒ/2.8 maximum apertures but you do get more zoom range, though at a higher price. The other alternative would be to go the prime route. Both Canon and Nikon offer 24mm, 28mm, and 35mm fast aperture primes. Canon and Nikon offer ƒ/1.4 versions of 24mm (C, N) and 35mm (C, N) lenses, and ƒ/1.8 versions of a 28mm lens (C, N). Going this route, you do gain some low-light shooting capabilities with faster apertures. The individual lenses themselves are also smaller (and some are weather sealed -- no such luck with the Sigma here), however the overall weight of your gear bag (not to mention the price tag) would be way more than just carrying the Sigma 24-35mm. I am a wedding photographer and more general events. I have used this lens on a minimum of 20 events so much. There is a high quality to the way that this lens captures photos that I have actually never seen prior to in a zoom lens. It is as sharp as any of my Nikon prime lenses as well as has the verstility of being a zoom. 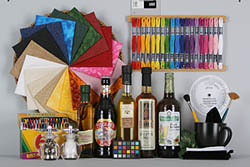 It has outstanding control of flaring and provides colors very normally. This lens has a pretty certain focal length and matches well into a bigger environment that I utilize to fire wedding celebrations. Besides the various other more customized lenses I use to catch particular special elements of a wedding event, I constantly have my 70-200 on my 2nd video camera and also feel certain I will certainly have the ability to capture any moment the second it occurs with this arrangement. As a pro wedding photographer, I can't state enough advantages regarding this lens!